It's the story of what many people believe to be the first momentous step toward the civil rights movement. When a Pullman Car was leased to a railroad, it came "equipped" with highly-trained porters to serve the travelers. The cars were staffed with recently freed slaves, whom Pullman judged to be skilled in service and willing to work for low wages. Soon, The Pullman Rail Car Company was the largest employer of blacks in the country, with the greatest concentration of Pullman Porters living on Chicago's South Side. In their home neighborhoods, to be a Pullman Porter was considered a prestigious position. The job offered a steady income, an opportunity to travel across America, and a life largely free of heavy physical labor, rare for blacks in that era. Historian Timuel Black recounts, "They were good looking, clean and immaculate in their dress, their style was quite manly, their language was very carefully crafted, so that they had a sense of intelligence about them ... they were good role models for young men." But the porters were also mistreated, underpaid, overworked and subjected to countless indignities on the job. "A Pullman Porter was really kind of a glorified hotel maid and bellhop in what Pullman called a hotel on wheels," explains former porter and historian Greg LeRoy. " The Pullman Company just thought of the porters as a piece of equipment, just like another button on a panel - the same as a light switch or a fan switch." Pullman demanded 400 hours a month or 11,000 miles - sometimes as much as 20 hours at a stretch -- and paid ridiculously low wages (in 1926, an average of $810 per year -- about $7,500 in today's economy). "It didn't pay a livable wage, but they made a living with the tips that they got, because the salary was nothing, " says Lyn Hughes of the A. Philip Randolph Pullman Porter Museum. The company expected its employees to pay for their own meals, supply their own uniforms and shoe polish, and allowed them only short naps on couches in the smoking car. Disgruntled porters began to question their situation and decided to take on the enormously powerful company. Located at 10406 S. Maryland Avenue in Chicago's Pullman Historic District, the Museum Gallery was founded in 1995 by Lyn Hughes as the first African American Labor History Museum in Chicago, in tribute to A. Philip Randolph, the Brotherhood of Sleeping Car Porters and the African American Railroad attendants. The exhibit features a collection of historical photos preserving and presenting moments in time. It seems that the Great One was a memorable passenger. "One of the most remarkable stories I liked hearing about was how when Jackie Gleason would ride ... all the porters wanted to be on that run. The reason why? Not only because he gave every porter $100.00, but it was just the fun, the excitement, the respect that he gave the porters. Instead of their names being George, he called everybody by their first name. He always had like a piano in the car and they sang and danced and had a great time. He was just a fun person to be around." CHICAGO STORIES: Who were the customers on your train? HODGES: Oh, some of everybody. Joan Crawford and different movie stars. I forget the one movie star that gave me $10. She said "come up to see me." You remember that movie star who said "my name is so-and-so, come up to see me sometime." Well, I had her on the trains. CHICAGO STORIES: Mae West. You remember her? HODGES: She said, "My name is Mae West, come up to see me sometime." I didn't pay that no mind. Long as I got the money. It's sad to see the personal stories from history die with the men and women who were present at the time of the events. Finding former Pullman porters who were alive when the union was created is difficult; they are a dying breed. We were very lucky to find Mr. Hodges who turned 99 on Valentine's Day. He was delighted to share his memories with us so that we could bring this story to you. You can hear more personal stories of former porters, who have passed away, at the A. Philip Randolph Pullman Porter Museum on Chicago's South Side. One of the things I was shocked to learn was that Pullman porters were not paid for morning hours. If a porter worked a run from 8 a.m. until 5 p.m., he was only paid for the hours after noon. The porters were also required to arrive at their trains hours before departure time in order to prep the train with towels, linens, etc. The porters were not paid for these hours. On many occasions, they were required to start a new run immediately following the end of another, given no break in between and no time to see their families. The Pullman Company was adept at pitting one race against another. The various jobs at the Pullman Company were usually filled by one race. When the porters decided to strike, the Pullman Company hired Filipinos as strike breakers. The Pullman Company was sending the message, "You can and will be replaced." Lucy Kinsella has produced many documentaries for A&E and the History Channel, as well as independent projects as far away as Tanzania and as close to home as Chicago's inner city. Architecture in the Pullman Historic District is unique as this community was built in 1880-84 as a planned model industrial town by George M. Pullman. Randolph and Bayard Rustin founded APRI in 1968 to continue the struggle for social, political and economic justice for all working Americans. CHS has a collection of photos, audio tapes, and Pullman Company papers. Newberry has the business papers from the Pullman Company, including employee records, and files on the company's efforts to crush the Brotherhood of Sleeping Car Porters. They also have a collection of photos. 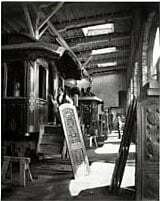 The museum has two Pullman cars, one built in 1910 and one built in 1925.